They are starting to lock up threads, so no more discussion will be allowed soon, nice. The "Police" here is amazing and no one complain. This is the other discussion "shut down". Yea i have the same ****, got globally banned for MULTIHACK #74005, i played this game for few thousands hours and got banned for cheating. This game and its whole anti cheat is yikes. We cant do anything about that because the punkbuster is "infallible"
You can blame server admins that you play on, first they use fake specs, and then they ban you for multihack when you complain that it said 49/64 and not 9/64. And well it's safe to say that abuse has never been a myth, tho threads may dissapear, people remember. Server admins can issue only private bans, they have the ban code BC2 irrespective of the remainder of the ban message, they also dont appear on the pbbans/bf4db/gcc lists. Not to mention the fact that some actually MANUALLY ENTER the ban using Procon simply to make a player THINK he / she has the PB Violation when in fact that's not really the case. I've had some of my community members join a random server ( can't mention due to name & shame ) that have used this method to simply to ban from their specific server! I've seen the screen shots to support this claim yet they can go into other servers with no problem. So you are 100% correct in what your saying StarscreamUK, I've actually seen this method used by some admins, now doesn't that make honest communities look bad. So for those of you whom are getting this PB ban I suggest try to join another server & see if you get the same message before you shout out you've been banned! well you can contact them, but the end result won't change. EA havent stopped you playing the game, you can still play the single player and on non punkbuster enabled servers. Online play has NO guarantee of availability, and can be withdrawn at anytime. This seems like a veritable hassle, if there's a way to do it once and get the approval of many, I'll do it, but this seems like a lot of thinking to explain a situation to a third party that will probably not care or at least take years to take in effect. Then please provide a list/link of non-PunkBuster enabled servers. 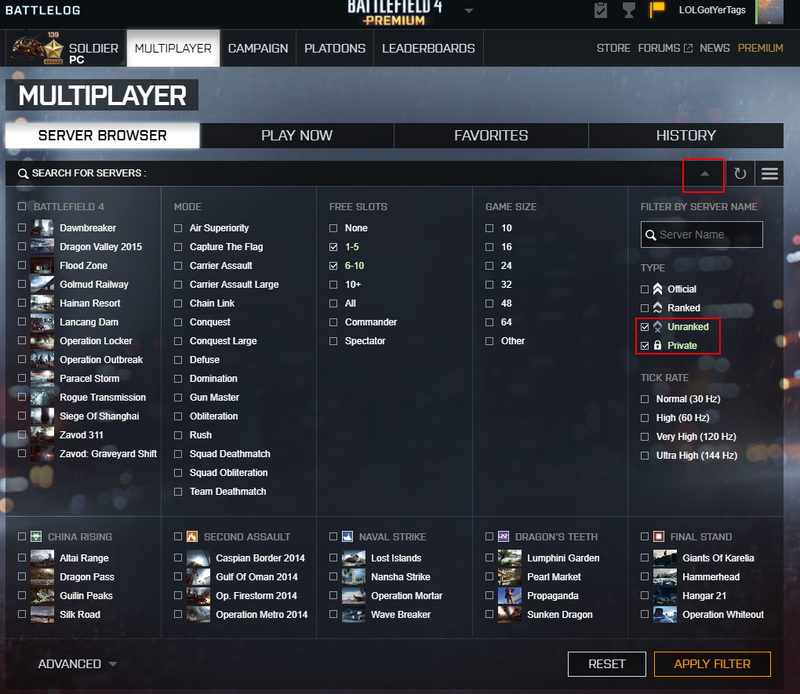 You can uncheck PB using the battlelog server browser. Click where the red boxes are. Would you buy a game just to play on Unranked servers? If the anticheat has made it so you can only play unranked, Then that is your only option besides the campaign. This is ridiculous advice, fix the damn problem. I know for a fact that I don't have to cheat to win the game. There is 0 way to appeal. and the only awnsers provided are, hey try talking to them or appealing, as IF WE HAD'NT ALREADY DONE ALL THAT FIVE TIMES OVER! Well I'm sorry but that's all you can do. You've appealed yeah? If so, Then it is in Evenbalance's hands. I do not officially represent EA/DICE. Welcome to the warning club, I will soon be banned from forum, soon.